This unique VPN combines internet connections, and prevents download pauses when your phone's Wi-Fi drops. Many people have multiple ways to get online these days. Not only by using various devices but also by using various internet connections, such as a home network and a mobile provider’s 4G network. Speedify VPN from Connectify tries to take advantage of this fact with a unique feature called channel bonding that combines multiple internet connections to make your experience faster and more reliable. At least that’s the claim, but how does it all work out? Speedify for Android uses the same design on Windows. Let’s start with Connectify’s “universal app” approach, which means Speedify uses the same interface whether you’re on a PC or smartphone. That kind of consistency is nice for novice users, but it does make for some usability trade-offs on the PC. One good thing, however, is that PC users can maximize the window to reveal a dual-pane user interface (UI), which is at least a little more PC-like even if it’s not the most efficient use of UI space. 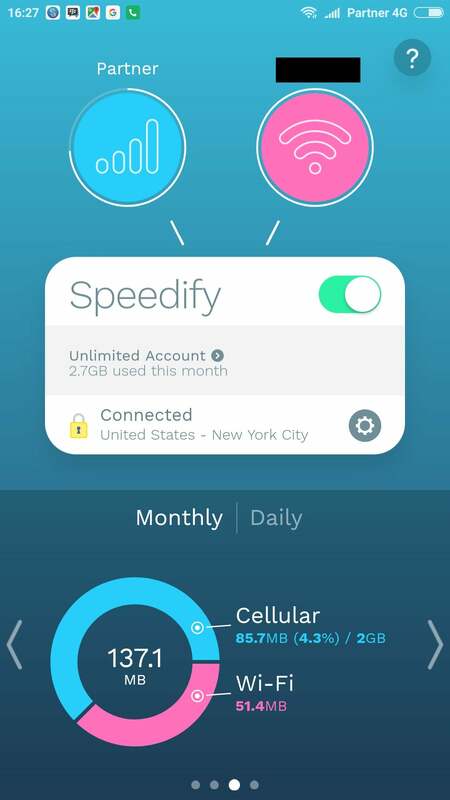 When you first open Speedify you get a simple panel showing your device’s available internet connections, and confirming whether you’re connected to the VPN. Below that there’s space for a series of graphs showing information such as your connection speed, monthly and daily usage, and current network latency and packet loss. Speedify’s approach seems to assume that you’re only going to want to connect to one particular country, because getting to Speedify’s various locations is not so obvious. Instead of a drop-down menu or a way to click on the section showing your location, you click on the settings cog. From there you can look at all the various locations. By default, Speedify connects to the fastest server available to you, but you can opt to automatically connect to a server that allows torrents. 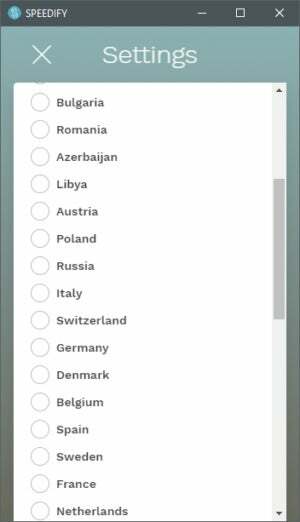 Otherwise, the country list is right below that allowing you to choose from the service’s 33 country-level locations. Diving into the rest of the settings there aren’t a ton of extra features in here. By default, Speedify is set to connect when you startup the app under Settings > Session > Connect at Startup. There’s also a “redundant mode” that sends all your Internet traffic across both connections, which is supposed to improve reliability. There’s also the ability to choose either TCP or UDP for the network protocol—by default this is set to auto. The big feature is Speedify’s channel bonding that improves connection redundancy and speed by combining multiple Internet connections into one. It also has a “failover” feature where if you go out of range from the Wi-Fi network everything will automatically continue over the cell connection. That doesn’t always happen as reliably with your phone’s default settings. I tested this feature by streaming a radio station via Firefox for Android and then walking away from my home network connection. Typically when I get out of range of my Wi-Fi the stream just stops and doesn’t continue on my cellular network unless I refresh the page. With Speedify running, however, the failover feature worked flawlessly with not even a hiccup between the transfer from Wi-Fi to 4G streaming. 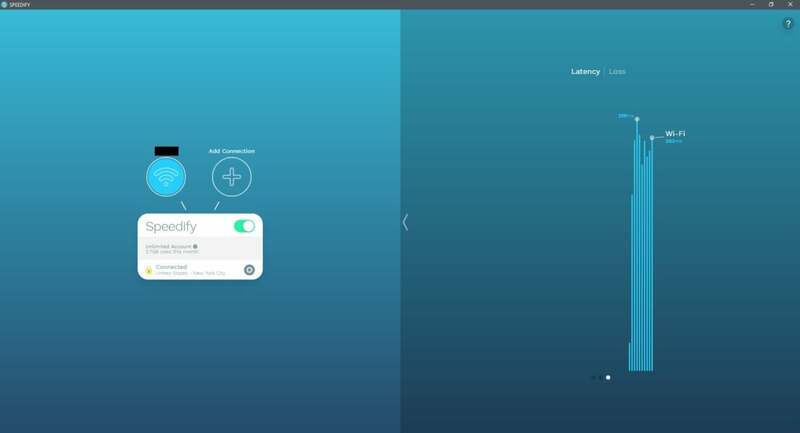 If you have annoying Wi-Fi dead spots in your home or yard that halt downloads or streaming, Speedify might be worth it just for fixing that. One feature on PCs that’s not on phones is under Settings > Privacy called “Super Secure Mode.” This is Speedify’s combination Internet Kill Switch and DNS Leak protection. Currently, this is a beta feature with plans to make it part of the default feature set in the near future. Connectify for Windows in its two-panel view. Since channel bonding is the big thing with this VPN we did the tests a little differently this time. First we did our standard PC test on a single connection over ethernet to see the base performance of the service. Then we tested again over Wi-Fi, which we don’t like to do since it introduces more variables than an ethernet-based test does. In this case, however, Speedify’s focus is on mobile so wireless is the main way people will use this service. We then added a USB tethered 4G phone connection to the test PC, and ran the test again using Speedify’s automated channel bonding. In the initial test, we found that Speedify wasn’t particularly fast scoring nearly 23 percent of the download speed. That’s not the slowest we’ve seen but it’s close. That’s an overall average, however, brought down by weak connections in Australia and Japan. Connections to the US, UK, and Germany were all high enough to let you enjoy most online tasks with ease. What was notable were Speedify’s upload speeds scoring nearly 50 percent of the base speed. Again, the US, UK, and German connections performed the best for this. Upload speeds were also where channel bonding got interesting. With a smartphone as a secondary Internet connection over 4G, upload speeds went through the roof, while download speeds dropped dramatically. The download speeds were not great but serviceable hovering around 10Mbps in the US, UK, and Germany compared to a base VPN-free Wi-Fi speed around 40Mbps. Upload speeds jumped to crazy numbers, however. The UK and German connections, for example, had upload speeds around 6Mbps—the default was under 1.87Mbps. Overall, with channel bonding upload speeds were 178.4 percent of the base speed, while download speeds dropped to 16 percent. In our tests, channel bonding did not help download speeds at all, but uploads were consistently improved. If you need to move data to the cloud while mobile—photographers in the field, for example—then Speedify’s channel bonding is well worth looking at. Connectify is based in Philadelphia with a street address of 1429 Walnut St FL2. The CEO is Alex Gizis, the company president is Bhana Grover, and the CTO is Brian Prodoehl. 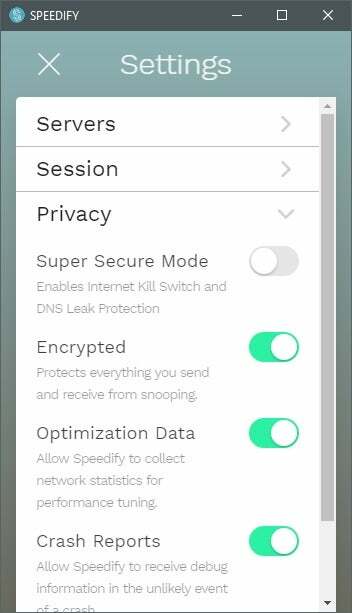 Speedify may also log your bandwidth usage, but users can turn off bandwidth logging by going to Settings > Privacy > Optimization Data. Errors within the app are also tracked, but users can turn this off at Settings > Privacy > Crash Reports. Speedify is a pretty good service. The speeds were not outstanding, but serviceable as a vanilla VPN service. With the channel bonding feature working, however, upload speeds were some of the fastest we’ve ever tested,. The price is right at $50 per year, and there are a ton of servers with enough country connections to satisfy most users. If you’re looking for zippy download speeds, however, there are better services for that. Speedify is a unique, mobile-focused VPN that aims to take advantage of multiple internet connections. It also has a nifty "failover" feature that keeps your downloads or streaming going over one connection, when another disappear.